Canon Stocks was born in Leeds in 1843. He was educated at Huddersfield College and at Christ Church, Oxford, and in 1867 took honours in Lit. Hum. Ordained deacon in 1868, he began his ministry as chaplain of Christ Church and curate of St. Philip and St. James, Oxford. His long connection with Leicestershire began in 1871, when he was nominated by his college to the vicarage of Market Harborough, where he remained until, in 1884, Bishop Magee transferred him to St. Saviour’s, Leicester. 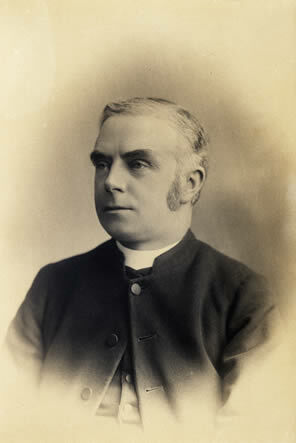 After eighteen years’ strenuous work at Leicester, he was Rector of Misterton near Lutterworth from 1902 to 1914, and for the next six years made his home with his son, the Rev. F. C. Stocks, Rector of Foston, Leics.. He was Rural Dean of Leicester from 1891 to 1899 when he was appointed to the archdeaconry of Leicester, an office that he held until his resignation in 1920. An Honorary Canon of Peterborough from 1893, in 1920 he moved to Peterborough as residential Canon at Peterborough Cathedral. He died there in 1926 and was buried on the south side of the Cathedral. Within the Church at national level, he was for many years a member of Southern Lower House of Convo­cation, where he was held in the highest esteem for his personal qualities, and for the remarkable tact, firmness and ability with which he carried out the difficult and responsible duties he was called upon to perform. Presidential Address 8th October 1894: “Literature and Leicestershire”. Transactions LLPS (New Series) Vol. 3, 1895, pp. 414 – 429.